Every Day Health, Inc., a leading provider of digital health and wellness solutions was looking for a fun, team building event in Philadelphia, PA for their inaugural sales meeting. Their mission was to assist employees, some who were getting together for the first time, to get to know each other better and to develop relationships. 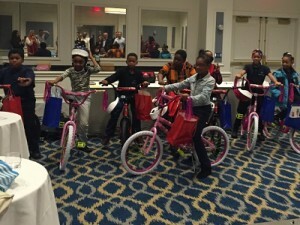 A Senior VP of Market Solutions at Everyday Health Inc. contacted The Leader’s Institute ® and was instrumental in organizing the event at the Westin, Philadelphia, Pennsylvania. Doors to the event room were kept closed until the participants who were coming from a meeting were allowed to enter. The activities were a complete surprise and employees were kept in the dark about what would ensue for the next 2 hours until the very last minute. When the event started, though, all participants had ample opportunity to get to know each other better through revealing, fun-filled, facilitated activities. They were then broken out into pre-planned teams and some serious and stiff competition took place to see which team was the most spirited. At the end of the event and after working together to assemble 8 children’s bicycles, The Boys and Girls Club of Philadelphia arrived with 8 lucky children who were being rewarded for good behavior and efforts and were able to ride out with brand new bicycles and big smiles. Boys & Girls Clubs of Philadelphia enable all young people, especially those who need us most, to reach their full potential as productive, caring, responsible citizens.